Romanticism, recklessness and finding humanity: From Somalia to North Korea with Alastair. Imagine taking your first solo trip at the age of seven to East Africa and contracting malaria. Try to fathom being drugged and waking up in a different city in the Philippines. Then envision yourself feeding a hyena off your back in Ethiopia, taking a bus into Somalia by yourself, and dancing in North Korea’s most famous square. This is not a wild dream, but in fact the odyssey of Alastair McCready. With a tireless desire for the reckless and romantic, this 28-year-old journalist has travelled to some of the most misunderstood places around our globe. And it has unquestionably shaped his inspiring perspective on what makes us all human. Born in China the year after the Tiananmen Square protests, Alastair’s experiences abroad began at birth. His parents had spent years working in some of the most far-flung parts of our globe, filling his childhood with stories of monkeys in the backyard of their home in Sudan and romanticized visions of what it meant to live in remote places. Even once the family moved back to their native England when he was two years old, their encouragement of exploration continued. While most of us start our solo adventures and learnings abroad well into our teens, Alastair is certainly not most of us. “My first big trip was Tanzania when I was seven. We’d traveled a bit [as a family] before that but Tanzania was the first big one by myself, with my brother. My mum, because she works in development, had a friend in Dar es Salaam. Our parents sent us out there, God knows why. It might have been because they were getting a divorce at the time and wanted us out of the house. I’m pretty sure in hindsight that was the reason. So we spent 6 weeks there. This understanding of the struggle many people face around the globe was further heightened when sickness struck. Instead of being utterly turned off of exploration by these challenges, this young explorer’s romanticized view of the world persisted. With small trips in between, his next significant step abroad came when he turned 21 and moved to the Philippines for half a year. Working for a peacebuilding non-governmental organization and playing soccer in the Filipino Premier League, Alastair lived in the capital city of Manila. Caught in the rain one day, two women approached him with an umbrella and an offer to take him to the fruit market he was searching for. Finding out they had previously lived in a similar area of London to him, he immediately found connection. This trip for work had been previously booked, but Alastair had no recollection of getting to the airport or getting on the flight. His work colleagues had been oblivious that anything was wrong with him. Always introspective, Alastair viewed this experience as a character shaping one, recognizing that as humans we are always vulnerable to making mistakes and equally acknowledging the different challenges faced based on the demographic group a person identifies with. Aware of his capacity to make mistakes, but still looking for that buzz gained through recklessness, he set off on his next adventure. This time it was back to Africa, starting in Ethiopia. Ethiopia, and its hyenas, however, was just the starting point of this adventure. “Harar is about 50 miles from the border with Somalia, so I got on this bus. There were no foreigners on it. It was a 15-seater bus with 40 people on it, live chickens and stuff and everyone was just looking at me. The word for foreigner there is the same, “barang”, so I heard everyone [saying], “barang, barang, barang, barang”. We got this bus to the Somali border and I walked across into Somaliland, which is a breakaway region at the top of Somalia. The rest of Somalia is completely wartorn and quite lawless and Somaliland broke off in, I think, 1991, to preserve their culture and society. They see themselves as a different clan and to protect themselves from the lawlessness and the war ravaging the rest of Somalia they made their own state, but no one recognizes it. I ended up spending my Friday night watching Crystal Palace beat Man United with all these Somali guys who love Man United. And it’s the kind of thing if someone said to you, what the hell are you doing in Somalia? What is there to do there? For me, that’s the point. There’s not a tourist attraction, there’s not anything to do. For me, the great satisfaction is just going somewhere and being in the local culture. It’s about feeling in control of what I’m doing, what I’m seeing. This sense of recklessness and a fascination with political systems led Alastair on another unconventional journey later that same year. This time it was to North Korea for five days. As all visits to North Korea are strictly controlled by the government, what travellers are able to see is limited. And while the novelty of being told what to do quickly wore off for this reckless solo traveller, there was one experience Alastair had that broke all preconceived notions about the country and its people. “It was 2015, the 70th anniversary of North Korea’s liberation from Japan in World War II. So they organized this mass dance in Kim Il-sung square, which is the main square in Pyongyang. They took us down during the night and we thought we’d sit in the stands and watch this propaganda event. To our surprise, all of these women in these bright, colourful dresses and these men in scraggly suits that were all matching came out. They got in their poses, ballroom dance style, and then these songs came on. They all knew exactly the same dance to do to the different songs. One song would come on and it would be a slightly faster dance, and they would all do it together in perfect unison. Maybe ten thousand people were all doing it in perfect unison. And then to our huge surprise they said to us, “don’t you want to go down into the crowd and dance with them”? It was the only time they ever let us by ourselves. It was incredible being that close to that many North Korean people when we’d been kept at quite a distance from them the whole time. For me the big thing was, just being that close to them, seeing how human they are. They would give you a little smile and it’s the kind of behaviour you’d see anywhere in the world, where people are interacting with tourists by giving you a little smile or a little wink or something like that. It was just the most human experience. These people who are so dehumanized in the press and so they don’t seem real. I don’t know if you feel the same, but they don’t feel real when you read about them. It seems like a robotic fun fair of a country. And so to see them was just the most incredible thing, to dance with the North Korean women was just incredible. The music was mesmerizing and fireworks went off. It was a complete out of body experience. That was the most incredible thing I have ever seen in my life. After all of these journeys and discoveries about humanity, where is this explorer now in his search for recklessness, romanticism, and an understanding of humanity? Since his trip to North Korea, he’s lived in Liberia, Thailand and Cambodia, and his inspiring curiosity doesn’t seem to have a foreseeable end date. Yet, as he so eloquently puts it, the most significant exploration we have to do as humans is always within ourselves. Make your next adventure even better. 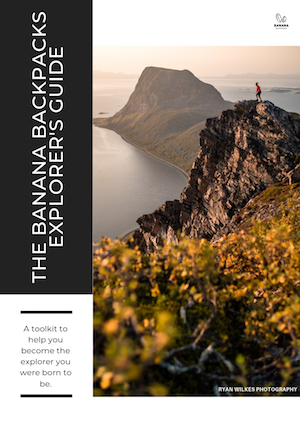 Get every Explorer’s top travel tip in this ultimate adventure guide.